For readers of Michael Lewis comes an engrossing tale of a country’s spectacular rise and fall, intertwined with the story of Brazil’s wealthiest citizen, Eike Batista—a universal story of hubris and tragedy that uncovers the deeper meaning of this era of billionaires. When Bloomberg News invited the young American journalist Alex Cuadros to report on Brazil’s emerging class of billionaires at the height of the historic Brazilian boom, he was poised to cover two of the biggest business stories of our time: how the giants of the developing world were triumphantly taking their place at the center of global capitalism, and how wealth inequality was changing societies everywhere. 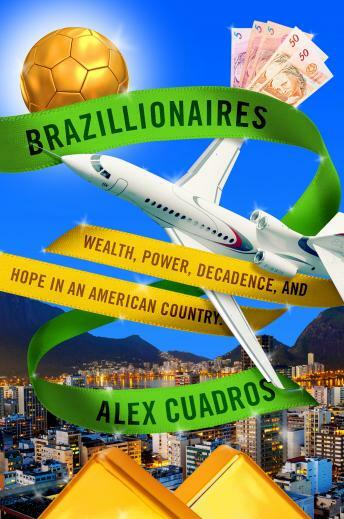 The billionaires of Brazil and their massive fortunes resided at the very top of their country’s economic pyramid, and whether they quietly accumulated exceptional power or extravagantly displayed their decadence, they formed a potent microcosm of the world’s richest .001 percent. Eike Batista, a flamboyant and charismatic evangelist for the country’s new gospel of wealth, epitomized much of this rarefied sphere: In 2012, Batista ranked as the eighth-richest person in the world, was famous for his marriage to a beauty queen, and was a fixture in the Brazilian press. His constantly repeated ambition was to become the world’s richest man and to bring Brazil along with him to the top. But by 2015, Batista was bankrupt, his son Thor had been indicted for manslaughter, and Brazil—its president facing impeachment, its provinces combating an epidemic, and its business and political class torn apart by scandal—had become a cautionary tale of a country run aground by its elites. Over the four years Cuadros was on the billionaire beat, he reported on media moguls and televangelists, energy barons and shadowy figures from the years of military dictatorship, soy barons who lived on the outskirts of the Amazon, and new-economy billionaires spinning money from speculation. He learned just how deeply they all reached into Brazilian life. They held sway over the economy, government, media, and stewardship of the environment; they determined the spiritual fates and populated the imaginations of their countrymen. Cuadros’s zealous reporting takes us from penthouses to courtrooms, from favelas to extravagant art fairs, from scenes of unimaginable wealth to desperate, massive street protests. Within a business narrative that deftly explains and dramatizes the volatility of the global economy, Cuadros offers us literary journalism with a grand sweep.